Students familiarize themselves with the day’s agenda. Thank you to The Park Avenue Armory for being a consistent partner of WHSAD’s. Through trips, artist-in-residence partnerships, internships, and employment, WHSAD students have enjoyed tremendous opportunities due to the generosity of The Park Avenue Armory. In the following narratives, students who attended this most recent trip recount their experiences and the impressions those moments left. 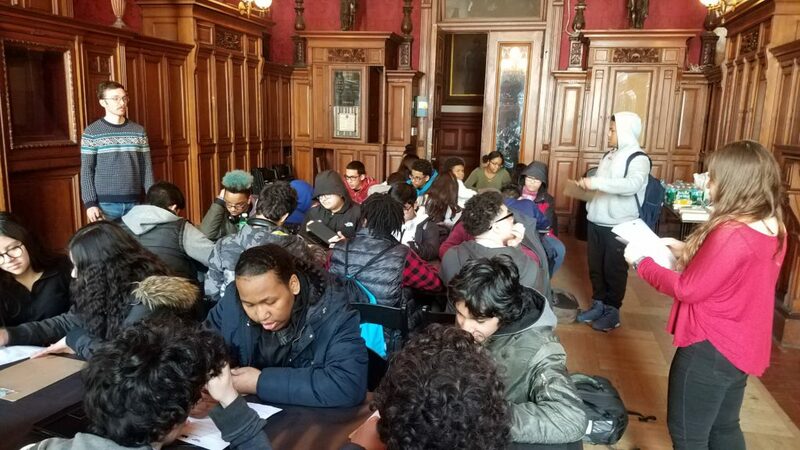 On Thursday, March 14, a group of WHSAD students visited The Park Avenue Armory. On this trip we did several activities. One of the activities was a scavenger hunt throughout the first floor of the Armory. We were able to freely roam throughout the rooms on the first floor. Inside these rooms, we were able to read about the history about the room and learn some facts about it. We would have to answer questions and find different artifacts around the room. We went through different rooms to look for historical objects. We learned about the history of the Armory. Inside the rooms, we would look at the questions for the scavenger hunt. The questions would have us looking for different things around the room and find things around the room. For instance, one of the questions was to locate the spot on the wall where the old wall paper was before the room was renovated. 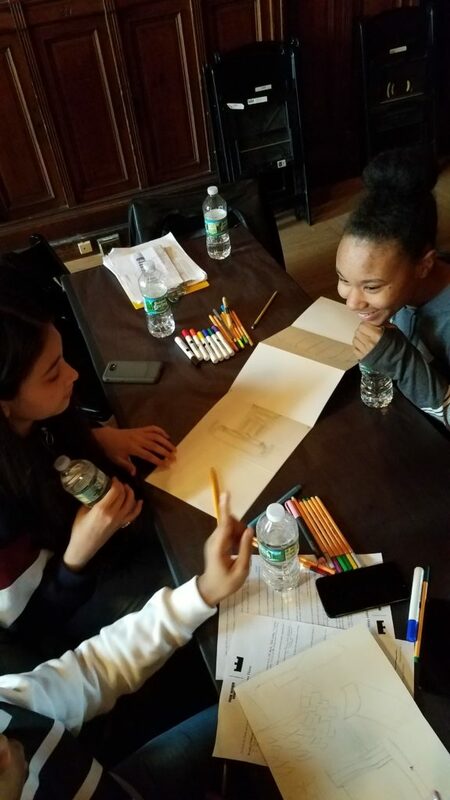 Students from Mr. Geringer’s and Mr. Rodriguez’s Architectural Drafting and Design classes put their sketching skills into practice. After the scavenger hunt, we went on a short tour of some of the other rooms of the Armory. We saw the old rooms in which companies would be stationed. These rooms included storage lockers and a board that would designate the chief, lieutenant, sergeant, and corporals of the company. Finally, we met a director who is currently producing his play at the Armory. He showed clips of music that has been created for the play and videos of dancers performing along with the music. The music was very creepy. The play had to do with outside creatures and aliens on different planets. The music was original and had one word that would constantly be repeated: death. Additionally, we were able to see the costumes for the play. They were very out of the ordinary. There were gowns, dresses and other type of costumes that would attract a lot of attention. Going to the Armory was an experience that really helped unlock my creativity. I gained a great deal of knowledge as well as enjoyed a fun break with my friends. We started with a scavenger hunt that provided many little-known facts about the Armory, such as the walls had to be repaired due to damage and the designs of certain rooms were unique to the soldiers who lived there. What started out as a way for me to get out of class became a fun experience which was worth doing. We learned a lot about the building’s history, and we learned about the possibility of internships and jobs working at the armory. The Park Ave Armory is a grand and magnificently historical structure located on the Upper East side. It has hosted a multitude of events ranging from Queen Elizabeth’s balls to baseball games since its original use by the Coast Guard during the Civil War. Students were given the opportunity to tour this stupendous structure, learning a bit of its history in the process, through a thrilling scavenger hunt. Given a list of objects to find, and an IPad for photographs, students traveled from room to room, admiring the architecture and learning the history. Towards the end, we were given a chance to visit the artist in residence who was putting together a symbolic piece of interdisciplinary arts pertaining to the role of our economic status in social society. We closed the trip with a meeting in the Veteran’s room, creating ideas of interdisciplinary performances we would execute in the Armory if given the chance, while engaging in the blissful devouring of quality pizza.